The goal at Remède Spa is to fulfil all expectations and help guests enjoy the indulgence and relaxation of a true Balinese spa. A moon and butterfly theme runs through the spa facilities, both in the treatment rooms and the main walking areas where, with special lighting, butterflies actually seem to flutter around, creating an atmosphere of calm and relaxation. No two facials or massages are the same. Trained therapists customize each treatment to ensure guests receive the most appropriate, beneficial treatment to meet individual goals. 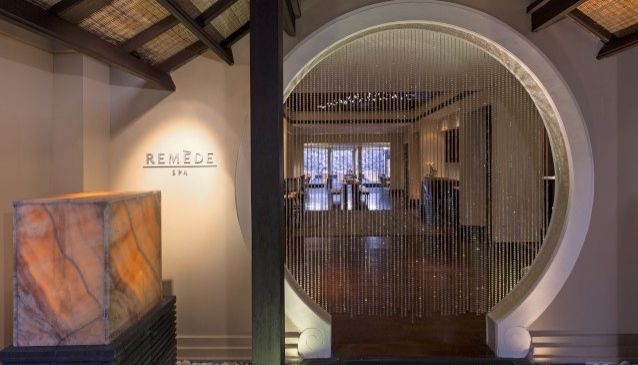 Remède Spa offers an exclusive selection of treatments featuring techniques and ingredients that reflect traditional Balinese approaches, employing gifts of nature including silken oils, soothing fragrances, and lush vegetation. This sublime convergence of local ancient and modern-day Remède products gives guests a true appreciation of the beauty and mysticism of the Balinese culture. The 2,800 square metre spa features 12 treatment rooms including a salon and two beautiful Spa Suites.